THREE town charities have been given a financial boost thanks to the efforts of last year’s mayor. On Tuesday, November 21 Les Sibley, who was Bicester’s Mayor for the year 2017/2018 handed over almost £10,000 to three good causes. Receiving cash was the Hummingbird Centre, £3263.88, Auditory Verbal £3263.88 and Bicester Foodbank £3257.34. 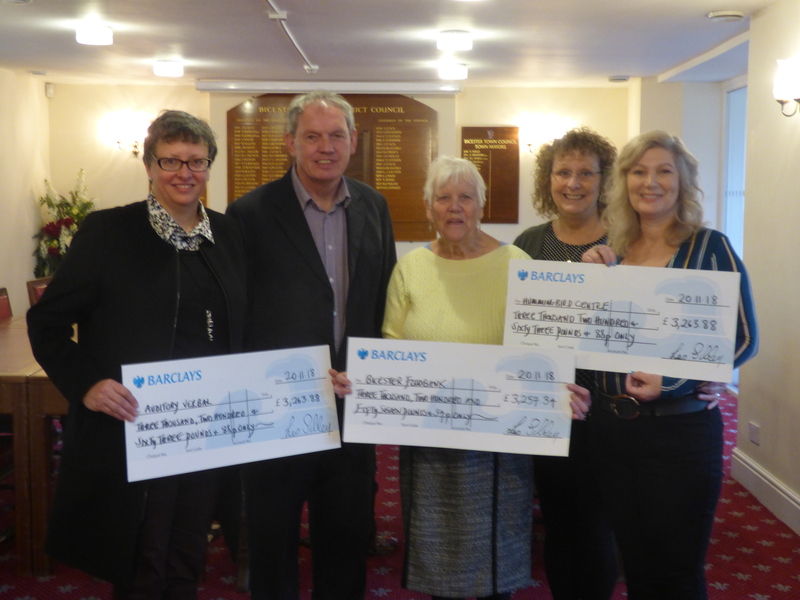 Cllr Sibley raised the cash through a range of events including the mayor’s charity dinner, a Last Night of the Proms concert, an Artists in the Town exhibition, a golf day and Bicester Carnival. Cllr Sibley, who was previously mayor in 1997/98, said: “I would like to offer my sincere appreciation and thanks to the many Bicester’s businesses’, individuals and the town council staff who supported and made these charity events possible. During his mayoral year, Cllr Sibley, who was supported by his wife Mary as mayoress, also held a series of one-off events to raise cash for other organisations including the Royal British Legion, Bicester Foodbank, Soldiers of Oxfordshire Museum, Bicester Green and Alexandra House of Joy. Cllr Sibley raised a total of £14,371.05 for good causes during the year. Bicester’s mayor is nominated for the role by fellow town councillors and serves for a year.